Tiffani Jacks talks with students in Joy Hysell’s third grade classroom at Meigs Elementary. 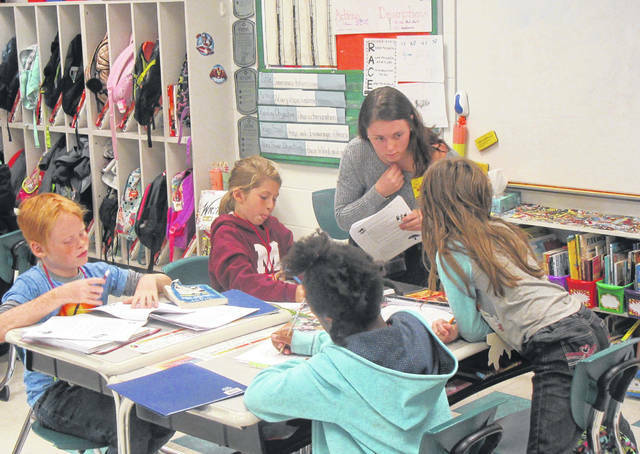 Hailey Marcum works with students in Joey Waters’ third grade classroom at Meigs Elementary. 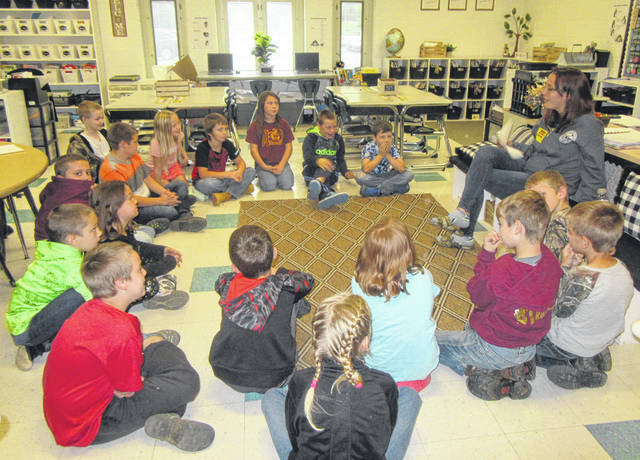 MEIGS COUNTY — For the past two decades senior citizens in Meigs County have spent time in the classrooms of area third graders giving them a lesson in Meigs County history. 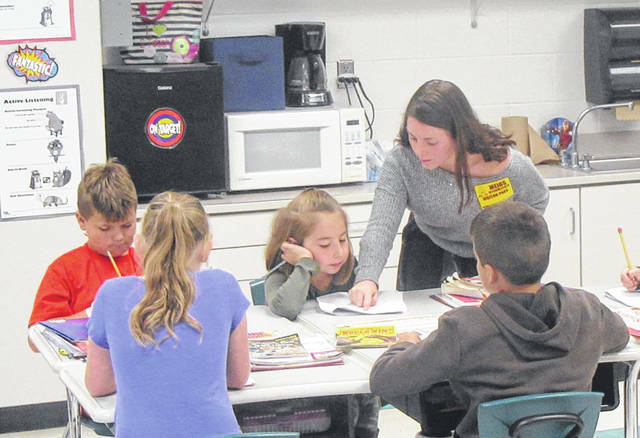 What began in three classrooms in 1997 has now expanded to all third grade classrooms at Eastern, Meigs and Southern, a dozen in total. The program is serving approximately 223 students this year. With the expansion came the need for additional volunteers explained Diana Coates who organizers the program through the Meigs County Council on Aging. Coates approached Meigs High School teacher Amy Perrin with the idea of having high school seniors work with the third grade students. Two students — Tiffani Jacks and Hailey Marcum — volunteered to take part in the program. Jacks said that when the opportunity was brought up to work with the students she decided to participate. Now, Jacks said she enjoys working around the kids and that it helps to brighten her day. She also enjoys the opportunity to teach the students about their surroundings and their home. Now, on Monday mornings, Jacks and Marcum spend time in the classrooms of Joy Hysell and Joey Waters working with their students on learning about their Meigs County heritage. The seniors have been working with the students on learning their addresses and about the townships they live in, conducting various activities and reading stories to them. Marcum explained that she has been working on activity boards for the students, along with other activities. On Monday, students were learning about Brewster Higley in one classroom, while discussing their favorite things about their townships and what they had learned so far about Meigs County. When asked what they had learned, the students responded with answers that included that Meigs is almost 200 years old and is shaped like a boot because of the Ohio River. The students and volunteers have booklets they work through with information about the county. Also included is information on the Underground Railroad, Chester Courthouse and Meigs County’s place in the Civil War. The eight week program, which is coming to an end soon, has been a positive experience for both the students and the senior volunteers. Hysell and Waters both commented that the students have enjoyed working with the seniors and look forward to the weekly visits.